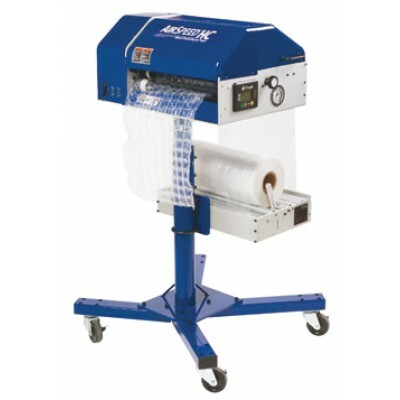 Fast: Produce pillows at speeds 75 feet a minute. Easy to use: Simply load film and press start. Lower packaging costs compared to other high end packaging materials: Reduce storage and material handling; low to no maintenance costs. Clean: No harmful and messy foam-in-place chemicals to use and dispose of. Unique Adjustable Air Pressure: Fill cushions to your specific height needs. True Perforations: Sheets are perforated for easy-to-tear, quick packing with no loss of cushioning due to perfs. Excellent Film Memory: Able to retain its shape and protective qualities when folded and manipulated or wrapped. Space Savings: One pallet of AirSpeed™ HC film can be converted into the equivalent protection of almost one-and-a-half truckloads of traditional bubble! No need to store drums of chemicals like Foam-in-Place. Great Clarity: Transparent material is more appealing than solids such as foam in place. The Airspeed ™ Hc System is ideal for these packaging applications. 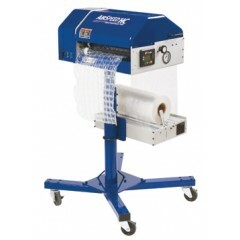 Below are the specs of film available for use with this machine.